Winter 2005/2006. Our Silver Anniversary spectacular! This massive double issue celebrates 25 years of Backstreets, but rather than dwell in the past, it's packed with exclusive Boss features celebrating the here-and-now. We interview E Streeters Danny Federici and Garry Tallent -- the latter is a lengthy, ten-page talk -- as well as Suicide’s Alan Vega, thrilled about Springsteen covering his "Dream Baby Dream." And then we’ve got Springsteen photographer Danny Clinch "In His Own Words" as well, accompanied by a portfolio of exclusive, beautiful photos. Devils & Dust coverage includes a massive song-by-song analysis of the album, as well as takes on the record from our readers and Backstreets editor Christopher Phillips. Then there’s 34 pages on the 2005 solo acoustic tour, with more exclusive photos, show-by-show reports, looks at the tour standards, Bruce's new instrument arsenal, stage raps and more. And an eight-page feature on the Glory Days Springsteen Symposium includes a debriefing with organizer Mark Bernhard. 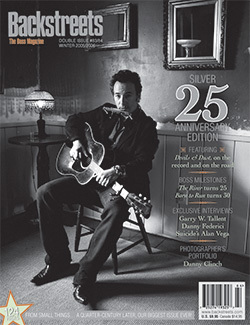 This issue celebrates not only our own 25th anniversary, but that of The River, with a retrospective piece from Jim Cullen; as well as the 30th anniversary of Born to Run, of course, with insights from some pros integral to the album’s reissue, Thom Zimny and Bob Ludwig. All that, plus our usual columns and Boss news including an inside look at Sirius’ E Street Radio, Boss book reviews (and a sneak peak from Dave Marsh at the Bruce book he’s got cookin’), reviews of the latest CD-Rs and Bruce boots, and more. 124 pages, full-color, our biggest issue ever. And our best? You be the judge. But be sure not to miss this one; our last anniversary double issue sold out fast!